A new study finds that the dinosaurs may have predated the rings and moons of Saturn. An amazing new study based on computer modeling of the Saturian systems suggests that its rings and moons are pretty young by solar system standards, clocking in at just 100 million years old, meaning that dinosaurs came into existence way before they did. Saturn has a lot of moons — 62 to be exact. And scientists have spotted signs that at least three moons — Tethys, Dione, and Rhea — are showing orbital tilts that are unusual for moons that have been around a long time and have been affected by the many other moons in orbit, suggesting that they were formed not that long ago, according to a SETI statement. 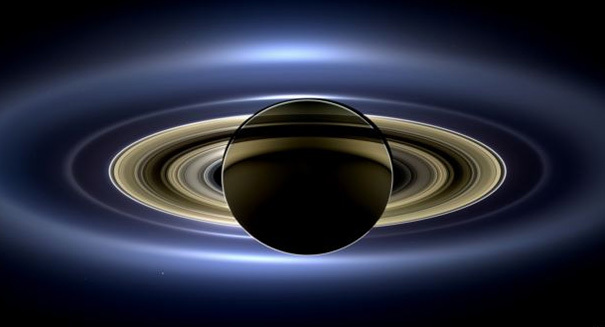 French astronomers in 2012 showed that tidal effects, or the gravitational influences of the inner moons with fluids in Saturn’s interior, should have caused the moons to move to larger orbits if they had been around long enough. Scientists in this case were able to go a step further, using computer simulations to find that Enceladus, for example, would have only taken 100 million years to move from its original orbital position to its current one, so it probably formed during the Cretaceous period, when dinosaurs were already roaming the Earth.